Wow, time is passing by so quickly, and with the busy end of the year at the school plus the work at AMA, I realize it's been a while since my last post. So let's get going. Part of the story is the idea that the aliens strike the earth using large EMPs, changing instantaneously any hi-tech human weaponry into a pile of useless garbage. That's how they win the war so quickly. I won't spoil all the details of the back-story here and now, but basically our hero found and old biplane that is immune to the EMP effects and will use it against the invaders. I thought having a low-tech biplane fighting Huber high-tech aliens would provide a strong visual identity for the game, something I think is utterly important. I choose a 1935 Waco bi-plane as a model, because it's a cool and beautiful piece of antique engineering and I think it is representative of the iconic image everyone has in mind of those magnificent planes. Also, it is a civil plane and not a WWI plane. This is on purpose and part of the back-story of the game. This image is from internet and copyright its owner/author. 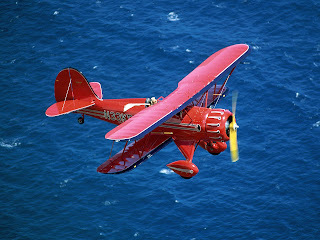 Usually, a plane like this can hold a maximum of two passengers (front seats) + the pilot. However part of my gameplay requires to transport humans to save them from the aliens. Only being able to transport two humans at a time was going to be extremely boring, so I had to devise some way of allowing the player improving the cargo capability of the plane. So I made this little concept that shows how the cargo capacity could be increased from 2 to 8 by collecting upgrade bonuses through the game. The same idea will be used throughout the game with extra weapons and structural modifications made available to customize and improve the capabilities of the plane. To implement this, I made the choice to increase cargo by steps of 2 extra seats. So 2, 4, 6 and 8 maximum. I then simply made 4 models of the plane, one for each capacity. Clockwise from bottom-left: 2 (normal), 4, 6 and 8 capacity. Bear in mind these models are still mock-ups and not the final modeling/rendering quality. Also, I've yet to think about the game color scheme and what you see here might not be representative. All upgrade models are exported in the same hierarchy and only revealed at run time when the player gets the upgrade. Same for the little humans in the plane (except the pilot who obviously always stays in). You can see in the Maya screenshot all moving parts being setup using point ant orient constraints, and ready to be animated in the game. All constraints are exported as they are and evaluated in realtime in the game, so I only have to animate (procedurally) the constrainer and any constrainee will behave accordingly. Finally, I improved a little the camera by adding an extra zoom behavior when landing on a platform. I think it will be useful when the final graphic assets are in place to see all the little details in the models. I thought it was nice without distracting from the gameplay. 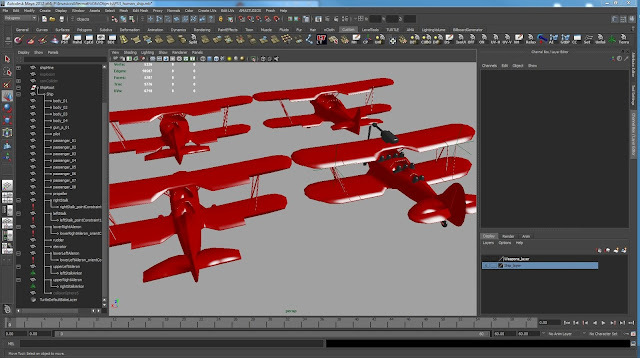 As you can see from the video, the wings span of the biplane is much larger than the one of the prototype ship I was using. I didn't want to have a tiny biplane to fly. Also my humans would have looked ridiculous. Instead I went for a little oversized plane but I didn't increase the size of the collision volume in order to keep the control as fluid as it was. This sometimes makes the wings get into the environment, but it's gameplay first in that case I guess. Je n'ai pas trop joué à Choplifter, mais dans le genre ça me fait penser à Desert Strike sur Megadrive que je connais mieux et que j'avais bien aimé. Ca reprend + ou - les même principes.